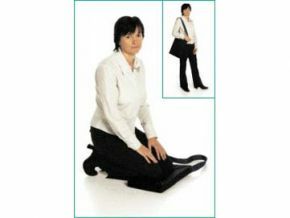 Therapist Kneeling Mat Provides Comfort While Kneeling. These kneeling mats are designed to give comfort and relief to the Therapist or District Nurse whilst kneeling and is also ideal for anyone who requires extra comfort when kneeling. The Kneeling mat consists of a firm base of polyurethane foam fused with Visco elastic memory foam to ensure the user can kneel comfortably for long periods of time.